The rational benefits of reading have been extolled at length and are varied: it’s an educational pastime, it’s social, there’s a simple pleasure to visiting a well-stocked bookshop or library. But the thing that really interests me is the unquantifiable; the magical: it is the finishing of a book. It is taking a second to let it settle in the mind and the heart. It is being in – and yet slightly apart from – your surroundings. It is getting on with the business of living after the book has happened to you. The moment varies in intensity and spirit depending on what’s been read. Sometimes we move quickly on, with the lightness of an untroubled mind, immediately forgetting much of what we’ve just read. Sometimes we linger as we reintroduce the back cover and the last page, feeling heartbroken, inspired, bewildered or philosophical, as the book colours the way we take those first few steps back into the real world. For my part, the imagery conjured up by George Orwell in his Homage to Catalonia remains with me from the first reading; the lucid recollections leaving a permanent impression on an adolescent mind dealing with the challenges, responsibilities and myriad journeys of impending adulthood. Devil May Care by Sebastian Faulks writing as Ian Fleming: not so. The finishing of a book is a brilliant thing to experience oneself, but an even better thing to witness. It’s a joy to watch someone close a book and try to judge how they felt about it from their actions and expressions. This is what I see as the reader’s “decisive moment”, their pause after the curtain falls and before the applause sounds, the second between the apple striking Newton and the forming of an idea in his head. It’s the stillness and clarity and optimism of that single moment at the very end of any tome that keeps me coming back to the bookshop or library in search of my next conquest and compels me to encourage the same venturing spirit in you. We never acknowledge it, but we avid book devourers are all in a club. And it’s changed our lives. It’s the Finishing a Book Club. I call on you to renew your membership today. Having looked at a few of the classics of ‘travel’ or adventure literature in Part 2, I thought it would be worth considering the outer limits of the genre in this post. After all, it seems logical that after the full extent of physical or spatial travel has been exhausted, humanity and therefore literature should turn towards other less obvious modes of travel. Where to go in fiction when the world is no longer a mystery in reality? This seems a preposterous question to ask in the 21st century, but would probably have been less so in the 19th century, when the possibilities of spatial travel must have excited the imagination in a way that is difficult to comprehend nowadays. In fact, a brief glance at Jules Verne’s bibliography betrays the progressive fetishisation of adventure: we have a simple enough start with Five Weeks in a Balloon and The Adventures of Captain Hatteras, before we move swiftly to the more ambitious Journey to the Centre of the Earth, From the Earth to the Moon and Twenty Thousand Leagues Under the Sea. Mr Verne is quite obviously pushing the boundaries both of physical travel and of our appetite for exploration literature generally, probably to breaking point and beyond. Even in the 19th century, there must have been a threshold for the public’s endurance of adventure fiction. Once a hero or heroine has gone up and down and sideways as much as is humanly possible, where to next? The answer I think can be found in the clear progression from R.L. 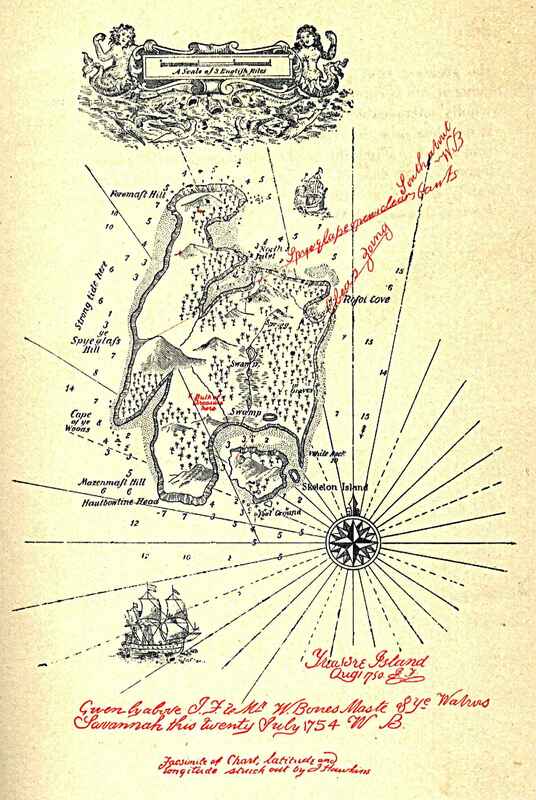 Stevenson’s romantic adventure novels of the 1880s (Treasure Island, Kidnapped) to H.G. Wells’ science fiction of the 1890s (The Time Machine, The Island of Doctor Moreau, The Invisible Man, The War of the Worlds). The first of H.G. Wells’ novels listed above represents a particularly interesting spin on the conventional spatio-temporal dimensions of the adventure novel. Indeed, the protagonist of The Time Machine, the Time Traveller, explicitly remains in the same location (a laboratory in Richmond, Surrey) whilst simultaneously embarking on a journey of discovery to the England of the distant future. This is thought provoking for a number of reasons. Firstly, in departing from the confines of spatial exploration, Wells subtly floats the notion that adventure is not merely the preserve of pirates and treasure hunters. In other words, whilst the Time Traveller remains locked in a laboratory, the adventure he undertakes is nevertheless very real. This seems to be getting at the idea that the scientists of the 19th century were just as ambitious in their quest for discovery as the explorers of the geographic world. Within the context of the adventure story, the idea that a man or woman could emerge from a confined space and claim to have encountered something previously unseen and unheard of must have been nothing short of revolutionary, bordering on the mystical. And yet, that is of course what scientists have always done. In a way, this makes their exploration all the more authentic and noble: scientific explorers cannot always count on the admiration of a timid public when they emerge from their adventures; more often they are greeted with a general lack of understanding and dismissive mockery. This introduces another fascinating element to the classic adventure tale: the idea of the returning traveller shunned for having the temerity to look behind the veil of accepted reality. The Time Traveller cannot be fully understood or believed, which is presumably one of the reasons he chooses to embark on another quest the day after his dinner party, this time never to return. Once again we encounter a hero in the Ulyssian mould, a man driven by a lust for knowledge and adventure, but also perhaps alienated from his peers in mainstream society. It is not hard to imagine, after all, that Ulysses, having returned home to Ithaca after ten years of travel, would have struggled to convince Penelope that he had been kidnapped by a Cyclops. The frustration of not being fully understood is the universal curse of the keen reader. When a reader emerges from the solitary world of book-reading, there will almost inevitably be a gulf between that reader’s appreciation of reality and everyone else’s. However much a book is dissected, explained and shared with others, the reading of it is inevitably a deeply personal experience. This is, of course, both terrifying and exhilarating: no one can do the reading for you, just as no one can visit Southeast Asia for you, which is why summaries and SparkNotes unfailingly miss the point. And when the heavy-lifting is done, when War and Peace lies conquered on your bedside table, no one is there to congratulate you or admire your newly-found intellectual acumen (or newly-found sense of existential despair). Any sense of triumph is purely your own, like a lone Himalayan climber who, having successfully reached a summit during the day, is forced to dig a one-man shelter in the side of the mountain at night. Over a number of years this thought led C.S. Lewis towards his espousal of the Christian faith, which he saw as the only satisfactory counterpoint to the inherent restlessness of the human heart. Similarly, Ulysses’ condemnation in the Inferno is heavily linked to his pursuit of knowledge by purely terrestrial means (i.e. physical as opposed to spiritual travel). For Dante, as for C.S. Lewis, the only way to arrive was to embrace God. However, turning away from religion, it is clear that a large part of what we derive from books and travel comes from the process itself. In other words, we often undertake both not as necessary steps towards a fixed goal or “arrival”, but as activities we enjoy in and of themselves. This is certainly where Robert Louis Stevenson was coming from when he declared that “to travel hopefully is a better thing than to arrive.” Indeed, despite his frail health, Stevenson was a man constantly on the move, and his travel writing (notably In the South Seas, 1896) is said to have deeply influenced Joseph Conrad, who also travelled extensively in the south Pacific and used it as the location for much of his own work (see Lord Jim and Victory). The idea of travel for its own sake plays a prominent part in Stevenson’s Treasure Island, a novel which dwells on the invariably anticlimactic nature of achieving a specific goal or arriving at a specific place. The treasure itself becomes a corrupting influence, and is depicted as a stale symbol lying in stark opposition to the travel and adventure that precedes its acquisition. Gold requires a sophisticated system of exchange to recognise its value; in other words, it is inherently worthless. And yet, despite the absence of a meaningful objective, the central quest of Treasure Island is portrayed as a welcome antidote to the drab professionalism of nineteenth century Victorian England. I was read to before I learned to love reading. My sister and I would lay attentively, tucked into our twin beds as my father’s slow melodic voice lulled us to slumber. As he sat reading I would fall in and out of new and familiar worlds, and although I can’t remember any of the books he read, I can remember the feeling being read to gave me: it was comforting. Perhaps being read to made me lazy, I don’t remember reading much as a child. I was further behind in literacy than most of my year. It wasn’t till University, a little after University in fact, that I would find reading a prerequisite for happiness. Suddenly books were something I had to read, rather than an extracurricular activity to take or leave. There is a magnificent power to literature, both in fiction and non-fiction, that nothing else in life can give you. My family never had the money to travel beyond Cornwall, I don’t have the money to travel beyond Europe. Yet I’ve seen Canada, China and Australia without needing to leave my living room. I’ve travelled through time, into space, through wars and into the minds of others. When fiction is at it’s best I’ve dropped periodically into experiences so vivid I have trouble separating them from my own. Reading is an inexpensive tool to expand the mind, both intellectually and emotionally. Reading inspires me to act in the world – not just participate. I understand others better, I am more accepting of difference and more aware of social injustice. I fight ignorance with each new book while simultaneously realising how much more I have to learn. As saccharine as it sounds, reading makes me think anything is possible. Why read? Why live once when you can live infinitely. Alice Farrant writes the blog ofBooks.org. Follow her on Twitter: @nomoreparades. Certainly, it must be accepted that seeing more of the world will not necessarily open the traveller’s eyes to the infinite subtlety of the human mind (unless perhaps said traveller is the 17th Earl of Oxford on a controversial visit to Verona) and, to this extent, any parallels we may seek to draw between reading and travelling are limited: the results we can hope to achieve from each activity are distinct, albeit potentially overlapping. However, in this piece I would like to focus more on the similarities between what it is that drives us to pick up books, on the one hand, and book plane tickets, on the other. Apologies for digging up Dante for a second week running, but I find it difficult to attempt to comprehend these underlying urges without referring to the Florentine poet’s conception of man as Ulysses preparing to embark on a final expedition, this time to the “unknown” half of the world that was thought to lie beyond the Pillars of Hercules (dividing Europe and north Africa). Dante sees Ulysses as the ultimate traveller, a hero perpetually and tragically in search of more. More what, exactly? More of everything, but most importantly more knowledge – “all men desire to know” – which is why he is a sort of anti-hero in the Inferno: he embodies both the desire for knowledge (always a delicate area where faith is concerned), and humanity’s inherently unsatisfied and restless nature. There is no doubting the fact that the search for discovery and the pursuit of knowledge drive, to a large extent, our desire to read as well as our desire to travel. We read books to find out what happened and how things work, to marvel at other people’s imaginative creations, and, above all, to marvel at beauty (see Why Read? No.17). We travel for similar reasons. Moreover, we may return to books and places, but there is nothing quite like the joy of the new, of experiencing the hitherto unexperienced. As such, there is a large element of risk-taking in both reading and travelling – not in terms of physical danger, obviously, but in terms of whether or not we ultimately find what it is we set out to discover. After all, it is one thing to seek the contemplation of beauty, for example, but another altogether to strike gold in a way that is distinctly subjective and personal to us. We may be recommended books to read or places to visit, and yet it is almost impossible to foresee what it is that will move or impress us. It is not uncommon to put down a book or return from a holiday thoroughly uninspired by the preceding ‘journey’. Invariably, however, we trust that there is something out there for us, even if it is hidden away on the other side of the world. Something that would be good to see, something we must see. Reading and travel are often viewed as activities of leisure, to be taken up in spare time away from the harsh reality of working life. I would suggest, on the contrary, that both are in fact often motivated by an underlying sense of urgency. See, for example, the frequency with which both inspire bucket-list discussions: “100 books/places to read/visit before you die”. That reading and travel might both reflect humanity’s consciousness of mortality is an idea that seems to surface frequently in Julian Barnes’ novel A History of the World in 10 ½ Chapters, not explicitly perhaps, but it lurks behind some of the more central themes. In particular, the story of Noah’s ark, which Barnes uses as one of many ‘pillars’ around which to base his 10 ½ narratives, connects the idea of salvation through physical travel to that of salvation through literature. That may seem a stretch but bear with me – the story of Noah is intended (in the Bible) both as a literal account of humanity’s survival by taking to the seas, and as an allegory for humanity’s salvation through faith. That faith is accessed and understood, at least doctrinally, via books, and the story of Noah appears in the first book of the Bible, Genesis. So should we be more inclined to see readers (ourselves) as intrepid physical and spiritual adventurers rather than as armchair navel gazers? Probably not, but there is undoubtedly a desperate yearning at the root of much of our literary activity, a yearning caught between despair at the inadequacy of what we know is true, and the hope of what might be true in the as yet unexplored landscapes of some distant reality. Barnes once again manages to convey this exquisitely in his assessment of Géricault’s Raft of the Medusa – a painting painfully split between an overwhelming sense of foreboding doom and a glimmer of hopeful expectation (see the tiny ship on the horizon). It is easy to imagine that Ulysses experienced something similar as he sailed beyond the boundaries of man’s earthly realm, glimpsing the mountain of Purgatory as he did, before being sucked down to the eighth circle of Hell. Dante Alighieri is well known for being the author of the Divine Comedy, probably one of the most important works written in the West in medieval times, given its continuing influence over the creative arts up to the present day. And yet not everyone knows his other works in quite the same way, particularly the Convivio and De Monarchia, which reveal his many interests and proficiencies as well as the staggering wealth and depth of his knowledge. As he shows off this encyclopaedic knowledge, certain themes crop up more than others, revealing the author’s particular interests. Perhaps the most prominent of these is politics. For Dante, to meditate on this theme meant to take stock of his own condition, so tragically determined by his political choices. Immersed in the Classical authors, Dante had assimilated the political thought of Aristotle and Cicero. As a result, he conceived policy as the way to create a pacific coexistence for citizens through laws and justice. In line with Classical ideals, Dante considered it a moral duty for everyone to be involved in political life if they had the capacity to do so. Being a politician in the Middle Ages was not exactly an easy ride. A centuries-old and at times ferocious struggle for supremacy was ongoing between the Church and the Holy Roman Empire. On the one hand, the pope wanted to exercise his power over the emperor as the head of a Christian nation. On the other, the German emperor was determined not only to obtain complete autonomy from the pontiff, but also to influence certain important decisions within the Roman Church, such as the designations of bishops and even the election of the pope. In the peripheries of the Empire, the tensions between these authorities reached a violent climax in Italy, at the time one of the richest parts of Europe, both culturally and economically. These violent conflicts, probably owing to the area’s proximity to Rome, were not only well documented in city records, but also in Dante’s own private reflections. There were two factions: the Guelphs, who traditionally supported the Pope, and the Ghibellines, allies of the emperor in opposition to the pontiff. The period was characterised by wars between neighbouring cities as well as within cities. This generated the climate of terror and bloodshed to which the Divine Comedy bears witness. The poet himself was banished from Florence and later sentenced to death for his political activism. It is worth noting the traditional reluctance of political theorists to deal with practical administration, from Aristotle to the early 16th Century. Indeed, only a generation after Dante, Petrarch, although he did write about the troubling Italian situation, carefully abstained from involving himself in it. In this regard also, the Florentine showed himself to be the brightest star in the Medieval cultural environment. Dante’s fascinating progression from Guelph to Ghibelline is not our main concern, however, as I would like to focus the discussion on his philosophical speculations, which were aimed at resolving the moral paradoxes of Christians who were involved in policy. To obey the rules of the Church or to obey the laws of the state? The debate was an age-old one, dating back as far as the 5th Century BC in Athens, when Antigone made her touching decision in Sophocles’ well-known tragedy. For the first time in the history of western literature, freedom of conscience had been recognised by the Theban heroine’s choice to prioritise the law of the gods over earthly laws. However the dichotomy which led her to sacrifice her young life remained intact and irreconcilable. Dante recalled St Augustin’s idea from De Civitate Dei and developed it, enabling him to heal this rift by illustrating the autonomy and necessity of both institutions as they descended directly and naturally from God. His explanation was a philosophical one: given that man is made of body and soul, his nature is both corruptible and incorruptible. And as any nature must have a purpose, Dante found that living in peace was the purpose of the body, and eternal happiness the purpose of the soul. Moreover, he identified two guides appointed by God to lead the people towards those aims: the emperor was the leader of earthly life and the pope was the leader of eternal life. As such, he argued that the emperor must have unrestricted power, since only a person who has everything does not desire anything else, and is consequently in a position to treat people equally. (Some of you may remember an Italian Prime Minister who used the same argument to win votes, but the final result did not quite match up to the idea!). The pope, as the Vicar of Christ, was only supposed to be concerned with giving moral instruction to humanity in order to secure their salvation, while supposedly being immune to all power and riches. 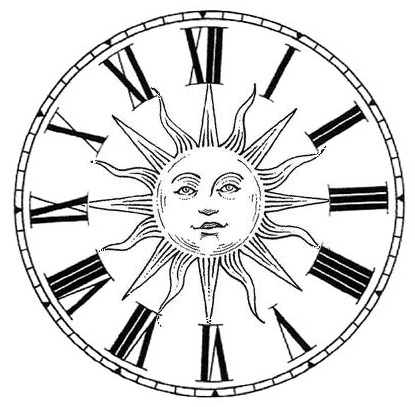 Thus Dante, as a Christian and politician of the early 14th Century, was able to corroborate the “Two Suns Theory”, an early version of secularism according to which the Church and the empire were two separate entities that were both necessary for humankind. Although his philosophical thought is rigorously scholastic, the poet approaches problems from an ethical stance, rather than treating them purely speculatively. His reasoning is never merely an end in itself but a tool with which to discover the solution to existing problems and situations. It doesn’t matter if much of our later reading gives Dante the role of a tireless and blind loyalist, belonging to an antiquated world. It doesn’t matter if he did not adequately consider the Italian bourgeoisie’s reinforcement as a pressing request of freedom and autonomy hardly compatible with the absolute power of the Emperor. It doesn’t matter if national kingdoms were appearing on stage as competing powers for the Holy Roman Empire, and therefore representing a serious threat for the political unity of Christianity. It doesn’t matter if Dante’s ideological structure, which he meticulously constructs in his works, was going to collapse like a house of cards. The great Florentine writer and philosopher should not be considered as a laudator temporis acti; that is, an inactive, slow and pessimistic reader of contemporary society. Rather he should be considered as a man who courageously made his critical skills available for the advancement of society, which, according to him, was the only possible means to achieve the advancement of mankind, and therefore the only way to reflect the divine order on Earth. If you like coffee and/or reading, it is inadvisable to go to a Starbucks, ever. There is not much for West London here, feel free to make suggestions. As long as they are not places like Daylsford Organic or Baker & Spice please, white marble and biscuits for £7 doesn’t seem that fair. This is Jim’s favourite location for our weekend meetings, however Tom has had trouble getting out of bed for these of late, so it is fair game. The people working here are very good at their jobs. The food is affordable and delicious. It has quiet corners and long opening hours. And now the weather is showing its true natures, the tourists will thin out. The brownies will kill you with pleasure. I got an old-fashioned look on questioning their Himalyan something tea, and it was very good. But the coffee is the point. Also their excellent brownies. The only downside is people who work in advertising go for offsite meetings in there, but they tend to have mostly gone to work by 3pm so the afternoon can be yours, and the weekends are more peaceful still. This is a large and beautiful establishment in Clerkenwell, and is a decent pocket of quiet in central London at any time. They deliberately do not have Wi-Fi in order to eliminate laptops, which I initially found annoying and now respect deeply. For those who cycle: Look mum no hands! Read your book while they mend your bike, and consume as much as you can while you wait. People who know about bikes also seem to like reading – they encourage it here by providing small tables spaced far apart – providing respite from the uncomfortable interaction between people who like sport and people who prefer reading. Also their walnut cake is famous. I used to go here every weekend. It is always serene. And there are exhibitions by local artists on the walls. Great coffee, large selection of food, frequent private views of art and a very generous loyalty card system. This restaurant in the LASSCO building is famed for its delicious menu, which deserves every syllable of hype. However it is also a delightful place to spend an afternoon, especially in the outside area on a clear day. There is not enough recognition of North London in this list, sure this would change if the Editors got to spend more time there, but this place is an ideal place for spending the afternoon and picking up some new books after a few cups of coffee. The coffee here is the best of the chains, and this particular branch has the quietest downstairs room I have seen on the weekend. Two stoic readers sitting 18 feet apart. Ideal. I am usually bored by the limply self-evident way in which people, having re-read a much loved book, say, “I take something different from it each time”, or, worse, “The book has changed with me as I’ve grown older”. Of course we read a book with different eyes each time we read it. Once we have experienced new emotions, a book will have new meaning; it will strike new chords. But the book will stay the same — the setting and the characters stay the same, and so does the plot, and the ending too. That is the case, except for a handful of very unusual books, of which one, perhaps the best, is Italo Calvino’s If on a winter’s night a traveller. I was struck by one sentence in particular in last week’s book club post: “The novel recognises that we are not actually the protagonist (the Reader) but it nevertheless invites us to become his proxy in a more direct manner than most books would deign to”. There is something in that second-person style that gives this book a changefulness not found elsewhere, that makes those tired statements we hear other people say about books changing ring true. If on a winter’s night a traveller sits in the Reader’s hand like a ball of clay, moulded by the Reader’s mind and thoughts into a different shape each time he reads it. Calvino has deliberately played with the very essence of the book, and the results are startling. As startling, say, as when the Visitor to the art gallery sees Velzaquez’s Las Meninas for the first time. The painting shows a room in the royal palace. 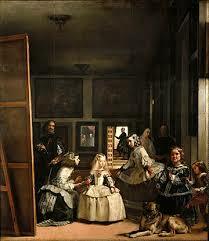 Behind the pretty little princesses and an ugly court dwarf, the Visitor sees Velazquez himself looking out from the canvas, brush and palette in hand, painting a picture that the Visitor cannot see. The Visitor feels uncomfortable under Velazquez’s gaze. He wants to peer around to see what Velazquez is painting on his other canvas. Then the Visitor spots a looking-glass at the back of the palace room. It shows two people, dim and blurred. A man and a woman. The king and queen, perhaps, having their portrait painted by Velazquez. But the Visitor stands where the king should be standing. The reflection should be the Visitor’s. Perhaps it is. The Visitor leans closer, over the rail, and the gallery guard coughs deliberately. Yes, now the Visitor starts to make out his own face in that old, far-off mirror. And he realises that Velazquez must be painting him. Velazquez and Calvino are playing the same, very compelling trick. As last week’s blogpost put its: “Calvino proceeds headlong into a story about what it means to be a reader“, in the same way that Velazquez asks what it means to look at a painting. The Reader must grapple with the discomfort of being addressed by a writer to whom the Reader has no right of reply. When we read a book in the third-person, or we look at a still-life painting, we can close the book or walk into another room in the gallery without the feeling that we are turning our back on someone trying to communicate with us. If on a winter’s night a traveller sticks with you long after you shut the book, because there is a funny feeling that you really were doing all those things Calvino said you were, that there really is a shelf in your favourite bookshop of Books You’ve Always Pretended to Have Read and Now It’s Time to Sit Down and Really Read Them. Perhaps, as last week’s blogpost concluded, “this is Calvino laughing at himself“. But he is also laughing at us, and he has the last laugh. Other people always say things better than you, and like most life truths this is a sort of good points/bad points deal. The good points are mainly related to The Immortal Beauty of Literature. Bad points include: Difficulty Winning Arguments, Takes Ages to Write an Email and Embarrassing Quality of Diary Entries. Language tends to act rough with lay users like you and me so when someone gets the knack it’s certainly a comfort to hear from them. Even coming at second hand, moments of articulacy feel like moments of ownership, as though you could have anything you wanted, appropriately categorised and filed inside your head. I don’t know why some sentences should seem so fist-pumpingly right but I’m too pleased about the whole business to start asking questions. I’ve always thought that being a reader feels a bit like having a blank cheque in a secret bank vault. Maybe it feels even better. Either way, it makes me feel considerably less sweaty about life than I otherwise would. Still, I’m sometimes nervous about the unfailingly good press enjoyed by readers. I don’t really think of my reading self as my purer self and tend to feel short-changed by accounts that only acknowledge the wholesome bits. Undeniably vitamin-rich though it is, I’ve always taken comfort in the fact that books also offer plenty of satisfactions that are vacuous, mean-spirited or at least reassuringly selfish. E.g. many prove to be excellent resources for thinking up unkind things to say about your friends. Famously, books have the ability to make you feel a little more at home in your own head; they name things you knew but didn’t know the names of and sort of draw your attention to bits of furniture you already had knocking about up there. They put their arms around your shoulders and say “I think you’ll find that this is how you feel”. This clearer or maybe deeper access to your own experiences can (I’m told) inspire all manner of noble deeds, but is also an unparalleled narcissistic high. It’s a bit like being given yourself as a gift, or like jumping out of your own birthday cake (SURPRISE!). Naturally when I am in a good mood I like to think about how reading makes me a totally stand-up gal by way of opening up whole worlds of empathy, understanding etc etc. And when I am feeling more glass-half-empty, I think that reading doesn’t make me more interested in other people at all, it just soups up my internal landscape, giving me the capacity to be of more interest to myself (which is nice but not necessarily virtuous). I suppose it works both ways really and I kind of enjoy the uncertainty. There’s something pleasingly private and non-committal about the way that reading straddles the selfless and the self-absorbed and something weirdly intimate about the fact that wanting to read isn’t quite the same as wanting to be good.